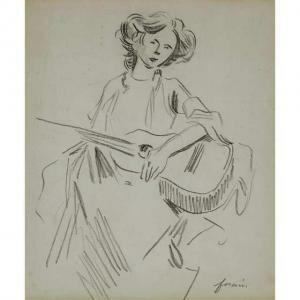 Find artworks, auction results, sale prices and pictures of Jean-Louis Forain at auctions worldwide. 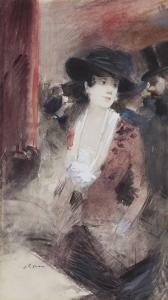 Jean Louis Forain (1852-1931) Au foyer du théâtre signed 'j l. Forain' (lower left) gouache and watercolour on paper 14 7/8 x 8 ½ in. (37.7 x 21.6 cm.) Executed in 1883 Provenance Madame Jane Renouardt (Madame Fernand Gravey), France. 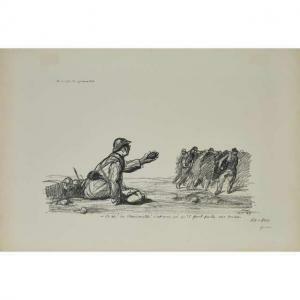 Private collection, Europe; sale, Sotheby's, New York, 8 May 2014, lot 218. Acquired at the above sale by the present owner. Sale 2498 Lot 257 JEAN-LOUIS FORAIN (1852-1931) DEUXIÈME SALON DU CYCLE. 1894. 35 1/4x83 1/2 inches, 89 1/2x212 cm. H. Herold, Paris. Condition B+: repaired tears, creases and restoration along vertical and horizontal folds. Two-sheets. DFP-II 362, Maindron p. 64, Maitres 51, Bicycle Posters 20, Abdy p. 106, Art Nouveau p. 67. 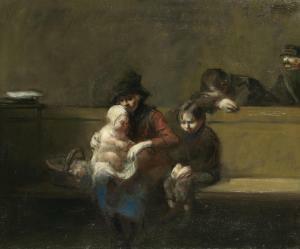 Jean-Louis Forain (French, 1852-1931) Scène de tribunal signed 'Forain' (upper right) oil on canvas 61 x 73.7cm (24 x 29in). Footnotes This work will be included in the Jean-Louis Forain catalogue raisonné currently being prepared by Madame Valdès-Forain. Literature Charles Kunslter, Forain, Pairs, 1931, (illustrated pl.48).